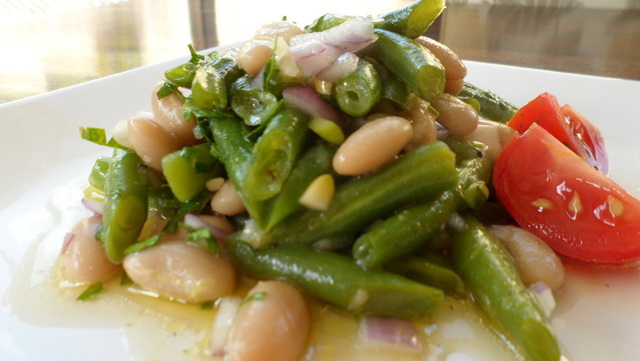 Tired of the same old 3 bean salad dishes? Try this for a different and delicious twist! Cook green beans to your liking. Crisp tender is good for this recipe. I microwave them for about 4 minutes and let them cool. Drain and rinse your cannellini beans (these are white kidney beans) and add them to the bowl along with the cooled green beans. Also add the chopped red onion and rinsed capers, if you are using them. In a small bowl or shaker jar, combine the dressing ingredients. Either whisk or shake to thoroughly combine the dressing. Taste and adjust the dressing before adding it to the salad. You may find that you like the dressing a little sweeter, so add more maple syrup. If you like it more lemony, add more lemon. Pour the dressing over the bean mixture and stir to combine. Let the salad set for at least 2 hours to allow the flavors to combine. Just prior to serving, add the parsley and another grind or two of freshly ground pepper. HINT: Ground mixed peppercorns (white, pink, black and green) are a great compliment to this salad!